ANTHONY MALVO Born on January 4, in Kingston, Jamaica, West Indies. Anthony Malvo began his singing career in the early 1980"s in Kingston Jamaica on the Legendary "Black Star Sound System. Malvo later moved on to perform, and record with the Reggae Producer label " King Jammys . Anthony Malvo, songs , ‘Rain From The Skies’, and “Come Back To Me “ both with reggae artist Tiger are of Anthony’s first recordings. The single entitled " Come Back To Me" on the “Techniques” recording label by Winston Riley was a number one hit . Malvo continued with numerous hit songs like " Can You Stop the Rain, " Ready or Not", Sensi, featuring Josey Wales, " Greatest Gal Lover", Jump spread out" , both featuring Daddy Lizard." Jump Spread Out" made the American Billboard Chart back in the 1980's which lead Malvo & Daddy Lizard to perform in the legendary Apollo Theater in the USA in Harlem of New York City. Malvo has voiced many hits for a number of Jamaica’s top producers in the style of a dancehall singer. In the early 90's Anthony Malvo worked with Reggae Producer & Reggae artist Anthony Red Rose , and together they started their own music production recording label named after Anthony Malvo hit song , which was produced by Sly and Robbie on the Taxi Recording Label, entitled " How Yu Fi Sey Dat." Together Malvo, and Red Rose recorded, and produced their first number one hit song for Beenie Man entitled " Wicked Man". The hit songs continued on singles such as " Report to We" recordings featured Sean Paul, "Quarter to Twelve," recordings featured Simpleton, " Bag Juice on Base, featuring Fabby Dolly, Dun Wife, featuring Cobra, "Antichrist, and Captain Barky. On the " Guns and Roses," recordings featured great reggae artists such as Bounty Killa, Anthony Malvo and Anthony Red Rose. " On The Die Without You," recordings featured reggae artists such as Brian & Tony Gold, and Capleton. His initial hits include ‘Come Back To Me’ and , and ‘Take You To The Dance’ with Daddy Lizard. The combination hits were followed by a solo venture recorded with Bobby Digital, ‘Can’t Control The Feeling’ and, ‘Can You Stop the Rain”. Malvo is best known for his work with dancehall singer Anthony Red Rose when his career peaked in 1994. The duo enjoyed individual hits on their "How Yu Fi Sey Dat" Recording Label, Anthony Red Rose sang about the ‘Ganja Man’ while Malvo performed ‘Sensi’ on an”Identify “ rhythm in combination with Josey Wales. Malvo produce the " Identify Rhythm " with reggae artists such as Capelton, Glen Washington, Junior Kelly, Dawn Penn, and Admiral Baily were also produced on the "Identify Rhythm" . The songs was placed on Capleton's VP records Grammy nominee album entitled " Still Blazing" , and " Jah is Going to Work it Out". Anthony Malvo had also made great hits with Frankie Paul, Red Dragon, Snagga Puss, Daddy Lizard, and Flourgon. Both Anthony Red Rose and Anthony Malvo created ‘Never Get’, which was rendered in a call-and-response style. They also produced a number of Jamaica’s top performers, including Red Dragon ‘Sweetheart’, Beenie Man ‘Name Brand’, Chuckleberry ‘Woman You’re Hard’, and combinations with Merciless, Prezident Brown, and Spragga Benz with ‘You A Mi Heart’, ‘Red Alert’ , and ‘Reminiscing’, respectively. In 1996, after maintaining a low profile, Malvo released the popular ‘Main Ingredient’, as well as producing successful hits for" How Yu Fi Sey Dat" recording label. In 1999, Malvo decided to launch his own recording label, "Real Music Production." The first single solo he produced was" My Heart Belongs to You" . Then in 2002-2003 Malvo produced and recorded another hit rhythm entitled, " Ballistic Affair " with Anthony Malvo and Capelton. Together they recorded, "One Day Rude Boy". The music video was featured on the Jamaica's top-ten video chart, and broadcasted on air in the United States, Canada, and had reached many parts of Europe. The " Ballistic Affair Rhythm " also featured reggae icons such as Buju Banton, Sizzla, Shinehead, Anthony B, Bushman, Wayne Wonder, and Warrior King. In 2003- 2004 Malvo released a compilation number of hits songs that were the foundation of his singing career, entitled " The Best of Anthony Malvo, Eighties and Nineties". The album was released through VP Records , and was a huge success in North America , and the European market. The album is still available through VP Records. Later of the year of 2004 , Malvo also released a rhythm compilation LP/CD entitled, " Hot Gyal" on his "Real Music Production " record label in collaboration with VP Records as part of their Riddim Driven Series. The " Hot Gyal" riddim featured reggae artists such as Brian & Tony Gold, Bounty Killer, Capleton, Sizzla, Gipsy King. Mr Lex, Vybes Kartel, Anthony B, Wayne Wonder, Daville, Lukie D, Round Head with Anthony Malvo ,and many more great reggae artists to just name a few. In 2006, Anthony Malvo released the " Sit Dun Pon it" Rhythm featuring Capelton, Pinchers Bandelero, Vybz Karel, Luciano, Blessed , Shinehead, Anthony B, along with Anthony Malvo and many more great reggae artists. Anthony Malvo released "Ungrateful" in 2009 with a music video featuring himself which hit the charts internationally, and in Jamaica. "Ungrateful" stills continues to be a great hit on air today. In 2010 anthony Malvo released his lover rock song entitled " Spoil fi mi Woman" . Year after year Anthony Malvo continues to make great songs that aired on the radio across the globe . In 2011 Anthony Malvo released" Cyann Draw Wi Out" featuring Sizzla, and Bad Mind People," which both are currently being played on air across the globe. Anthony Malvo has also toured the United States and Canada performing in a variety of venues, nightclubs, festivals, outdoor activities, and private functions sharing his great music productions to all his family ,friends and fans. In October of 2011, Anthony Malvo performed in Boston, Massachusetts for the American Cancer Society, and received an award for his support, and musical contribution toward the successful breast cancer event, and also received another award in Bridgeport Connecticut, a " Lifetime Achievement Award" for his 30 years of his contribution to Reggae Music as he was completing his tour with his friend and reggae artist Flourgon. From 2011 until 2014 Anthony has been touring the world doing live performances while visiting many family, friends, and keeping his fans alive. He has also worked on his new album Stronger, and had a CD album release party in Long Island, New York at the Dunns River Cafe along side of Reggae icons Junior Demus , Flourgon, Tonto Irie, and a host of deejays ,family, and friends that supported the event. The Stronger album is now released, and available on Itunes featuring songs like " Can't Draw me out" with Anthony Malvo and Sizzla, "Hot Outta Street" featuring Anthony Malvo, " One Day Rude Bwoy" featuring Capelton. Anthony Malvo also released his new song entitled " All Of Me" a cover from John Legend . Most of Anthony Malvo greatest singles can be found on Itunes. See more of Anthony Malvo songs available on https://itunes.apple.com/us/artist/anthony-malvo/id81248432 . 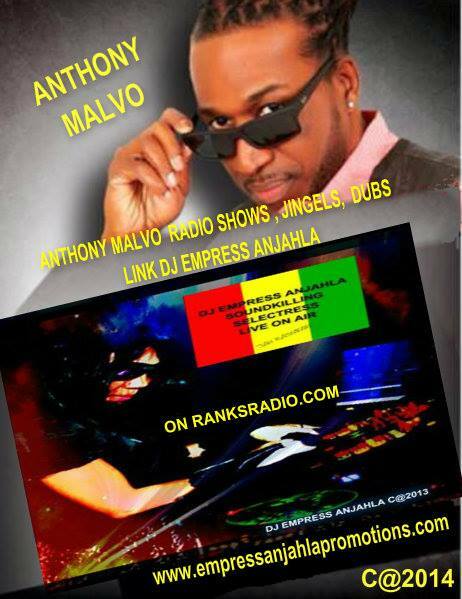 Anthony Malvo history in the Reggae Music Industry has been rich and impeccable. Malvo’s music experience has provided him with many opportunities to work with countless singers, musicians, and Dee Jays during his many tours in North America, Europe, and the Caribbean Islands. His plans for the future are , to produce, perform, and create positive real music for his friends, family and fans around the world. Currently, Anthony Malvo is still working on some great new songs with Reggae Producer Ed Robinson, including his new hot single " Hurt You” featuring Lady Genius, and many more new songs to come. Today, Anthony is touring with Admiral Bailey, Tiger, and Johnny P doing live performances. 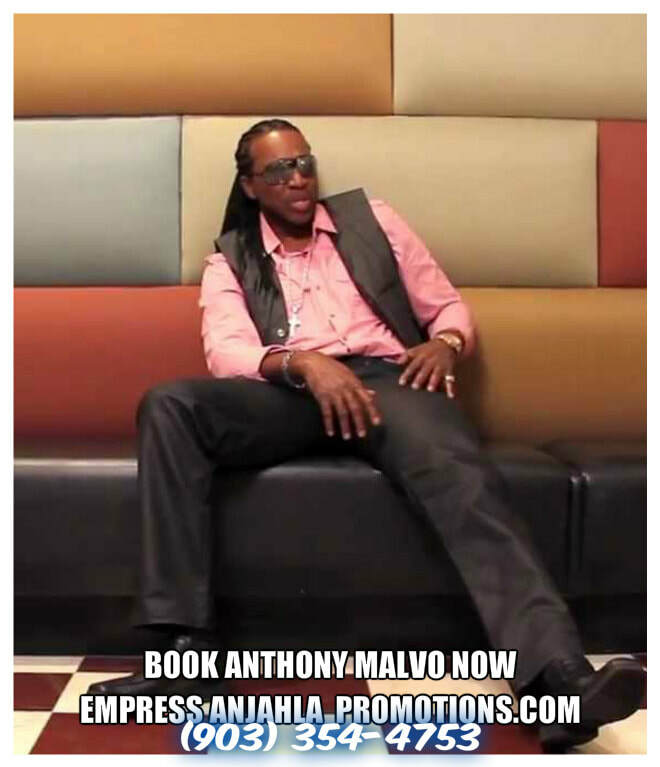 Anthony Malvo will also be on a exclusive television interview , with a short live performance of " All of Me" on the Cablevision TV network, Channel 68 , Bronx New York in the USA hosted by Reggae Artist/ producer TV host Cherri Poet , DJ Empress Anjahla THE CEO of Empress Anjahla Promotions, http://www.empressanjahlapromotions.com/anthony-malvo.html with the two Reggae artists that she manages Tilly Beng Beng and Mikey Slow on Music Vibrations produced by reggae artist Mystic Culture. See this interview on Cabelvision/Optimum channel 68/Bronx. Tuesdays @7pm / Sundays@4pm. Online at www.bronxnet.org sneak preview available at http://youtu.be/BTffW3LX_Ow . Interested in contacting Anthony Malvo for studio work, shows, magazine, radio or television interviews contact information is listed below.